We all hoped this year would be something special, and it was in that fervor that I decided to start game threads. It's been beyond enjoyable, and this has been such a fun year to watch the re-emergence of Michigan basketball. Great year. Why the hell not? Win the whole thing. Nice choice of photos. I will always love Douglass and Novak and what they have meant to the rebuilding process. 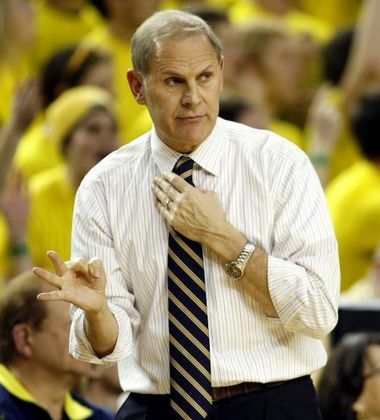 And Beilein...what do you say about a man who has quietly climbed the mountain on his own terms, never indulging in self-hype or compromising for an easier route to wins or career advancement? I heard the Michigan radio guys say last night that Burke is one of the most decorated athletes in school history. That's quite an accomplishment for a lightly recruited PG out of Columbus. I hope he goes out a national champion. and hear we go again.... Talking heads - "Louisville Louisville Louisville''. This team almost went down to a nine seed. A good nine seed, yes. I'm not saying we'll blow them out, or even win. But have we learned nothing? SDSU - "Michigan should win this one, but watch out! Could be an upset"
VCU - "Sexiest upset pick in the first weekend. HAVOC! HAVOC!" Kansas - "Michigan's run is over. Nice try. Bill self, seniors, 'phog', etc, etc." Syracuse - "Best 2-3 zone in the galaxy, nice try blue, good luck next year." I've actually heard WE now have a size advantage with some of these Louisville players, and that they're going to try to slow down Burke. Fine by me. We've proved all tournament, save Kansas, that we can win with a crappy Trey. Someone please forward that to Mitch. This will be a good team. And by good, I mean they might actually win a tournament game or two. The returning core of this team played a sadly easy schedule, backed into a share of the B1G title, and lost in the first round of the tourney. And that core, along with a coach who has never been to the elite 8 as far as I remember, is supposed to lead this team to a FF? With a key recruit who is dropping like a rock and didn't start for his own team? The funny thing is, it seems to be the consensus. Real quick, name a player who had a nice year for John Belein and then got better the next year? I just don't see it. I really don't. And those ifs I listed? Not likely. This will be a very untested team who will probably win a bunch of games only to get ran by a better coached team. I like the match up against Louisville much more than I did against Syracuse. UM has the guards to beat the press and they actually play better when they get up and down the floor. Should be a great game. It's been quite a fun tournament to watch. So thankful there is one more game. 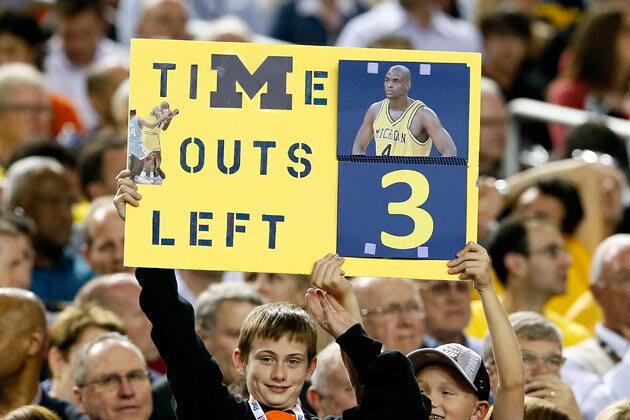 I love John Beilein. Go get it. I always thought that the "no contact for 10 years" thing between Webber and Michigan meant he could not attend their games? Also, I'm on the bandwagon with RJ. Coming in to the Final Four, I thought that Syracuse would be by far the biggest match-up problem for Michigan out of the three other teams. I doubt UM can control Webber going to an NCAA championship game. This is pretty darn exciting. National championship game. Wow. Been a whirlwind from the start of the season til now. Either way, what a memorable season, lets end it on top. I've been saying "Just get to 'X' " all season long. It started as "Just get to the sweet sixteen, everything else is gravy". Then it was, "just beat Kansas, everything else is gravy"
But now, I'll be very disappointed with a loss tonight. Not in the team, just the result. If feel exactly the same. Following college sports is kind of strange. The teams are comprised of a bunch of kids, many of which can't even order a beer at the bar using their government issued id. The faces are always changing; the name on the front stays the same. At the beginning of every season I start off rooting for the name on the front, but by the end if the year I'm rooting for these particular kids. I want them to win for themselves. So, like you said, I'll be disappointed at this point if they don't win, but not disappointed with them. At the start of the tournament, the chance of winning it all is very low, even for the top seeds. 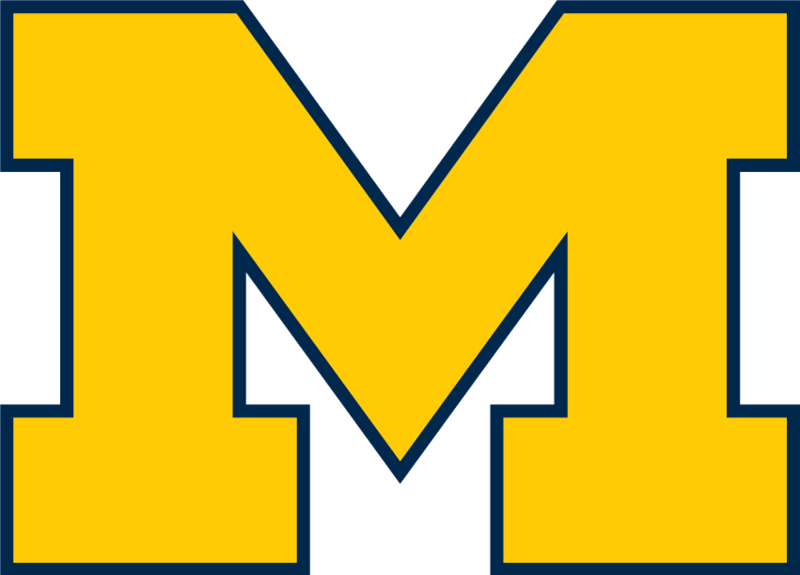 As a four seed, michigan's chances were remote. So I felt that if they could make it to the second weekend it would be a successful tournament for them, relatively speaking. I didn't expect them to beat Kansas, but they had a game for ages. At that point, I really wanted them to beat Florida so they could raise a banner. This is a special team, with four guys that could leave and be drafted in the first round. It will be a while before we see another team as good as this one. Once they got that banner, they did enough, and they could hold their heads high had they list to Syracuse. Before that game the odds were still long. But now, at this point, they are playing a single game. Everyone on the court is playing the biggest game of their life. Either team can win. There is no next game looming that they could end up losing. That changes things. With the title 40 minutes away, I'll be bummed if they lose. They will still hang a banner, but the ultimate prize will have been lost. This was long winded, but I am rooting for trey, Tim, nik, glen, and Mitch to win a national title. They will give it their best shot. If it doesn't happen, I'll be disappointed, but more for them, not at them. Really torn on this game, not how you think. After they got through the first weekend I was okay with whatever outcome until the second half of the Syracuse game. Had they lost that it would have been painful. I will feel the same way tonight, if they get close enough to win and don't it will be painfully disappointing. I really want this win for Beilein, Trey and Tim though. And things are teed up for Trey and Tim to go out with a bang. The freshmen have kept them alive in large part, now it's their turn. Personally, I like watching sports at home or someone elses home with a huge TV and surround sound. I am sucker for replays and cheap snacks at my leisure. If someone gave you the nosebleed seats for free and you were planning on going, but then you were offered 2-300 bucks for them, would you sell them?